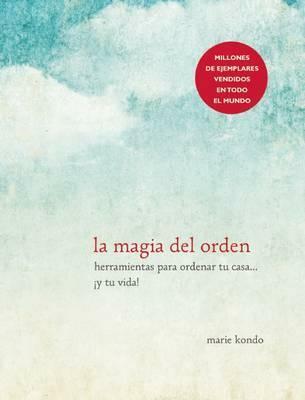 EL LIBRO QUE INSPIRO EL EXITOSO PROGRAMA DE NETFLIX, TIDYING UP WITH MARIE KONDO Transforma tu hogar en un espacio permanentemente claro y libre de desorden. Y no olvides buscar su nuevo libro La felicidad después del orden, donde te explica gráficamente cómo aplicar su Método KonMari. Recupera y aprovecha mejor los espacios de tu casa. ¡Recupera tu vida!. - No compres más cajas ni materiales de almacenaje pequeño. No lo necesitas. ENGLISH DESCRIPTION This #1 New York Times best-selling guide to decluttering your home from Japanese cleaning consultant Marie Kondo takes readers step-by-step through her revolutionary KonMari Method for simplifying, organizing, and storing. Despite constant efforts to declutter your home, do papers still accumulate like snowdrifts and clothes pile up like a tangled mess of noodles? Japanese cleaning consultant Marie Kondo takes tidying to a whole new level, promising that if you properly simplify and organize your home once, you'll never have to do it again. Most methods advocate a room-by-room or little-by-little approach, which doom you to pick away at your piles of stuff forever. The KonMari Method, with its revolutionary category-by-category system, leads to lasting results. In fact, none of Kondo's clients have lapsed (and she still has a three-month waiting list). With detailed guidance for determining which items in your house "spark joy" (and which don't), this international bestseller featuring Tokyo's newest lifestyle phenomenon will help you clear your clutter and enjoy the unique magic of a tidy home--and the calm, motivated mindset it can inspire.